PanARMENIAN.Net - Citizens of some 25 countries, including Armenians can now visit Oman on a non-sponsored e-visa, the country's police revealed on Wednesday, October 18, Times of Oman says. 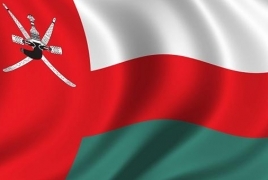 In a statement posted online, Royal Oman Police listed the 25 countries and said: "Regulations for Granting Non-Sponsor Tourist E-Visa for Citizens of the Following Countries: Armenia, Albania, Azerbaijan, Uzbekistan, Iran, Panama, Bhutan, Bosnia, Peru, Belarus, Turkmenistan, The Maldives, Georgia, Honduras, Salvador, Tajikistan, Guatemala, Vietnam, Kyrgyzstan, Kazakhstan, Cuba, Costa Rica, Laos, Mexico and Nicaragua. The regulations include that an applicant must have a passport that is valid for no less than six months after submitting the application, must be a resident or a holder of a valid visa of to one of the aforementioned countries; the US, Canada, Australia and the UK, or Schengen countries at the time of the application, must have two-way flight and a confirmed hotel reservation (in the Sultanate). The regulations also stated that accompanying spouse and children of a holder of the e-visa can also benefit from it. Times of Oman. Oman just allowed citizens of 25 countries to enter on an unsponsored e-visa. Is your country on the list?